Recently I visited the Grand Coulee Dam in Washington State. It is the largest man-made structure in America, built on the Columbia River during the Great Depression. Thousands were put to work building it, my father-in-law being among them. 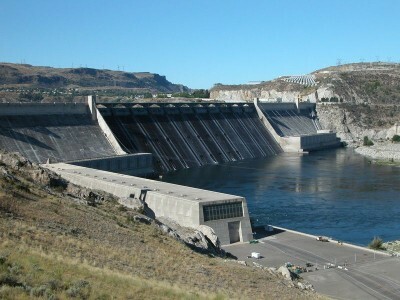 The dam now provides irrigation and power to a large section of the Pacific Northwest. Decades later it is helping people have a life of comfort and putting food on the table because farmers have water to grow crops. The amount of concrete in the structure is enough to build a sidewalk around the equator! The work that went into it is beyond imagination. A popular side attraction is a laser light show, demonstrating the creativity of people using today’s technology. I could not help but make a comparison as I looked at the dam and watched the laser show. Man’s creativity and construction pales in comparison to God’s handiwork. Romans 11:33 says, “Oh, the depths both of the wisdom and knowledge of God! How unsearchable are His judgments and unfathomable His ways.” God created the universe by speaking it into existence(Genesis 1), and it is so vast that even the Hubble Telescope is seeing only a small fraction of it. He created the mind of man that can do more calculations than a modern computer, and can engineer things like the Grand Coulee Dam. God can also do things with our lives that defies human reasoning and goes “beyond all that we ask or think”(Ephesians 3:20). Man builds huge structures and designs creative light shows, but God transforms human hearts and characters in all those who put their faith and trust in Jesus Christ. Not only that, God is preparing a special “mansion” in a place called heaven (John 14:2-3). There will “no longer be any death…any mourning, or crying or pain.” God is making ready an eternal city, “fifteen hundred miles; its length and width and height are equal” and where the streets are pure gold. There will be “no need of the sun or of the moon to shine upon it, for the glory of God has illumined it…” You can read about this in Revelation 21-22. God’s love, grace, and power far outweighs anything that man can do. Humanity thinks on the earthly and temporal. God thinks on the heavenly and eternal. Which is more important to you?